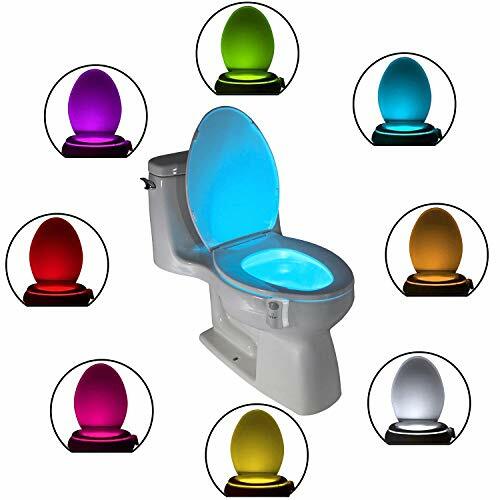 A toilet light is a very affordable way to give your toilet seat a unique and colorful look during the nighttime. It also helps you to locate the toilet easily without having to turn on the blinding white lights in the bathroom. This will make it easier for you to resume your sleep because, unlike bathroom lights, this one is quite dim, which means it does not burn the eyes and thus, does not interfere with your sleep. However, there are a lot of toilet lights in the market, some of which are substandard. 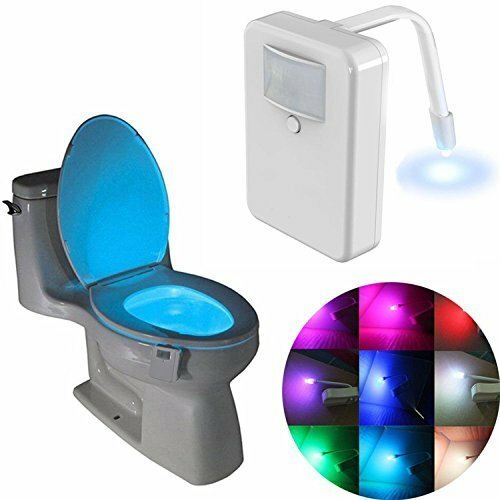 This article gives an in-depth review of 5 of the best toilet lights, with the aim of helping you find the most suitable one for your toilet. 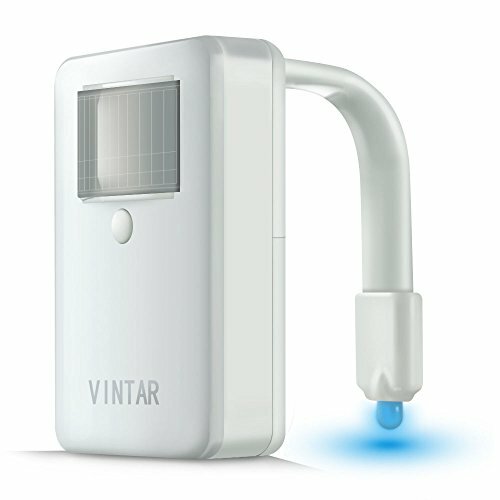 Vintar’s toilet light is a very advanced unit, comprising of a motion and a light detection sensor for energy saving purposes. The motion detector acts as a switch that automatically switches on the light once you enter the toilet and turns off once you exit. On the other hand, the light sensor deactivates the unit when it senses light and this ensures that it only works at night. Automating these two functions extends the battery life while also getting rid of the manual switching that would be otherwise required. In terms of color, this product’s LED can produce 16 of them and can be set to rotate from one color to the other in a carousel mode, or to light up in one color, simply by the press of a button. This enables you to customize the lighting to the mode that you prefer most according to your mood. Regardless of the color that you choose, each has a brightness setting and this gives you more control over the lighting by enabling you to set the appropriate illumination level. Again, this is simply set using an external facing button and thus, changes can be made as the unit is fixed on the toilet. On size, Vintar’s light can fit on any toilet because it has a soft and flexible PVC neck, which can expand and contract to hold onto different sized bowls. LEDs produce 16 different colors. Carousel and solid color mode options. Soft and flexible neck for fitting into differently sized toilets. Requires 3 AA batteries and has a low battery indicator in which a red light will blink 5 times. LumiLux’s toilet light is the most expensive product in this list but it has the features to show for it. Well, it is very similar to Vintar’s unit above with features such as 16 LED colors, in which you can choose a solid color or carousel mode to cycle through the colors once it is activated. Apart from color modes, a 5-stage dimmer is also incorporated into this product and it enables you to make the bowl as bright or as dim as you prefer on a 5-level scale. A light and motion sensor are used for activation, with the light sensor ensuring that the unit only lights up when it is dark (at night). This helps to conserve energy because during the day, lighting the toilet would be irrelevant. The motion sensor is responsible for keeping the LEDs off when you are not close to the toilet and detects your body heat once you enter the toilet to activate the light. This also helps to conserve a lot of energy. Solid color and carousel lighting mode. Flexible arm makes it fit on all toilet sizes. Requires 3 AA batteries and features a low battery indicator that blinks the red light 5 times. 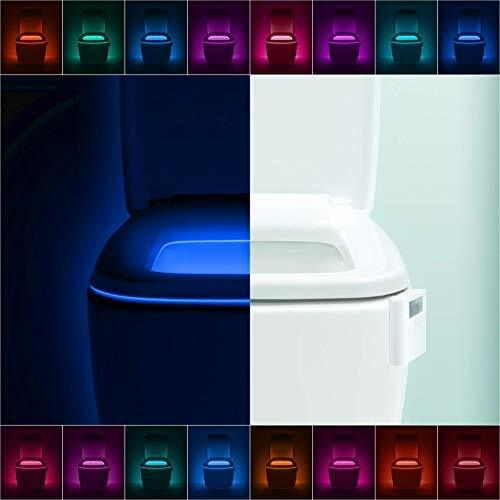 ToiLight’s toilet light also features LED lighting but has fewer colors, which include blue, red, pink, green, baby blue, purple, yellow and white. This totals to 8 colors, which are fewer than the 16 in the products above, but these can also be set in one color or rotation mode for a rainbow effect. On the bright side, this unit has both a light and motion detector, enabling you to conserve a lot of its 3 AAA battery power. The motion sensor automatically turns on the light when you approach the unit while the light detector keeps it off as long as there’s light from the outside. If the motion sensor activates the unit, the lights are designed to stay on for 2 minutes, after which they will turn off if there is no movement. This leaves the light on for some time if there is someone in line to use the toilet. In terms of design, this product has a flexible arm, which makes it possible to install it on toilets of different sizes, and has a sanitary design, which means it is crafted to always stay clean. Single color and rainbow lighting mode. Flexible arm for installation on differently sized toilets. 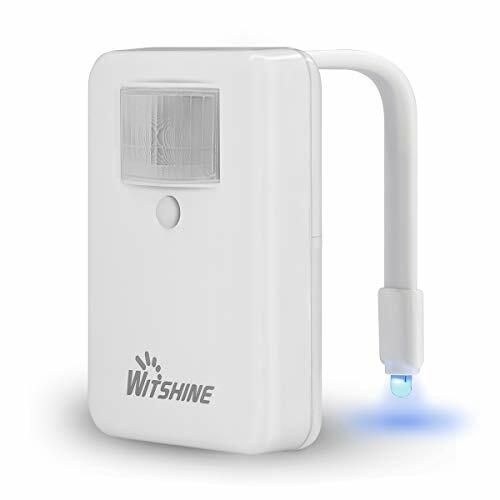 Witshine’s toilet light is the most affordable product in this review but this does not mean it is a low-quality product. In fact, it has 16 color LEDs, which means it is better off in terms of color as compared to ToiLight’s product above. The unit is powered using 3 AA batteries but these must be bought separately. Double-A batteries are advantageous because they can last for longer, usually up to 10 months. Additionally, they provide better performance than AAA because they are bigger and carry more charge. On installation, this light comes with a flexible arm, which can be easily adjusted so as to fit the rim of any toilet bowl size. For activation, dual sensors are built into this unit and they work simultaneously to power on or off the LEDs. A motion detector with a 170 degrees coverage is responsible for detecting any movement so as to activate the light. This wide coverage ensures that you are easily detected as you approach from any angle. On the other hand, a light sensor ensures that the unit can only be activated when there is low ambient light, which basically means that it only activates the light at night. Therefore, even if the motion sensor detects your movement during the day (when there is high ambient light), the LED will not light up. Powered using 3 AA batteries. Flexible arm for easy and quick installation on differently sized toilet bowls. Dual sensors for activation and deactivation. 170 degrees coverage motion sensor. This toilet light is a top-rated product because it is quite effective at lighting up the toilet in the dark. For controls, a button is used for setting the LED light from carousel mode (switching between 16 colors) to a single-color mode and vice versa. This button is also used to set the brightness level between 5 different dimming stages, enabling you to set the light intensity that you prefer to have on at night. However, the on and off switching is done automatically using a light and a motion sensor. The light sensor keeps the LEDs off whenever it detects high ambient light while the motion detector keeps the light off as long as there is no movement within its 150 degrees motion detection range. For installation, the unit features a flexible arm, which has the LED on the far end and can be bent to fit on toilet bowls of different sizes. Carousel and single-color lighting modes. Light and motion sensor for automatic on and off switching. 150 degrees motion detection range. Flexible arm for quick and easy installation over differently-sized toilet bowls. 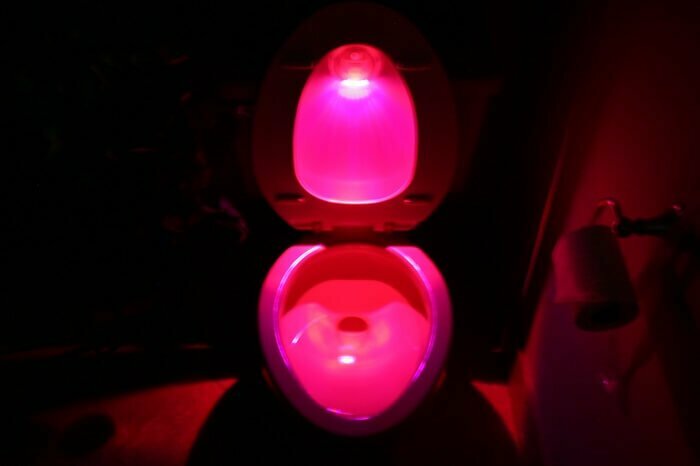 As much as lighting is the main thing that a toilet light should do, the colors that it produces also matter a lot. Some units have a maximum of 8 colors that they can produce while others double that to 16. The more the number, the better because this will make your toilet look and feel more colorful as you use it at night. Another important thing to consider is the lighting modes. Ensure that you have the option of setting the colors in a carousel (rainbow) mode so that they can create a beautiful display that will certainly make your visitors ask about the product. Additionally, a dimming mode would be a nice feature to have because this will give you control over the light intensity of your toilet light. Instead of switching on/off the light manually, automation through sensors is the ideal feature to have on a toilet light. Therefore, it is important to check that the product has at least dual sensors for automatic control. The dual sensors should include a light detector for ensuring that it remains deactivated during the day and a motion sensor to ensure that it remains deactivated whenever you or anyone else is not in the bathroom. This will also prolong the battery life because the lighting system will be more efficient in the process. Price is always a big factor to consider before buying any product. As such, before buying a toilet light, it is important to check its price and compare it with that of other units with similar features. If the light has fewer features or is inferior to the rest but is more affordable, it can be a good option if you are on a tight budget. However, if the product is inferior in terms of features and quality, and costs more than the other products, avoid spending your money to buy it. It is best to get the one that has the most features for the best available price. Accessories are always an advantage to have because they make the deal much better. When it comes to toilet lights, the most common accessory that you can get is a set of batteries to power the unit. Most of these products do not come with batteries and therefore, if you find one that has this accessory, you should consider buying it. However, an important thing to check when dealing with accessories is the price. Nothing really comes for free, which, in this case, means that the cost of the battery will be somehow included in the cost of the toilet light. Thus, if the price is too high, you might want to consider buying the toilet light and the batteries separately so as to determine which option is cheaper. Electronic devices have the tendency to fail after prolonged use. As such, toilet lights should have a warranty. The longer the warranty period, the better because this will save you from incurring repair or replacement costs, especially if the defect is as a result of a manufacturing error. Ideally, a 1-year warranty is good but if you get a lifetime warranty, the better. Although they are very small and simple gadgets, toilet lights usually have a lot going on in their construction and the components that run them from the inside. For this reason, it is important to find as much information about them as possible before settling down on buying one for your toilet and this article provides you with all the information that you may need, making it easier for you to pick the best toilet light for your home bathroom.